Batumi Birding aims to generate sustainable funding for nature conservation. We believe that well-functioning, local organizations are most effective in delivering conservation outcomes. However, such organizations struggle to obtain sufficient funding to cover their day-to-day management. Nature tourism has the potential to fill this gap, and bring the necessary stability that allows the organizations to grow and develop well-structured conservation programs. Falconers in Batumi often catch Levant sparrowhawks and other species that are impossible to train. Most of the time, these are simply killed. 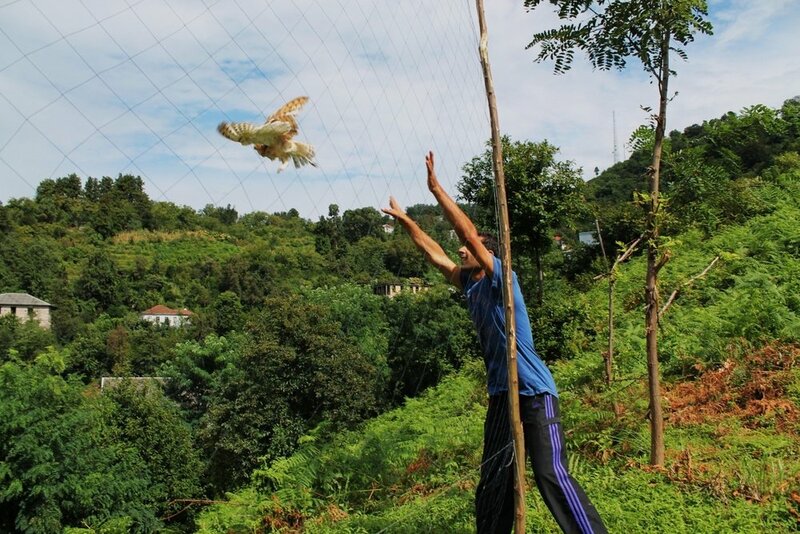 By engaging falconers in a scientific ringing scheme and stimulating their interest in the migration patterns of these birds, SABUKO has managed to convince them to keep ‘unwanted’ birds alive. The population of the Eastern Imperial eagle which inhabits the Georgian steppes is severely limited by a lack of nesting structures. Large trees have become very rare in the overgrazed landscape, and outside the Vashlovani National Park and the well-preserved riverine forest along the Iori, the only breeding pairs can be found on abandoned electricity pylons. SABUKO has created new nesting sites on the steppe by installing artificial breeding platforms, and established a network of ‘eagle watchers’, who protect the existing breeding pairs. Counters of the Batumi Raptor Count. Photo by Bart Hoekstra. The Batumi Raptor Count has been actively monitoring a selection of raptor species, of which a significant portion of the world population migrates through Batumi. These counts have contributed much to our understanding of the eastern flyway, and helped to estimate trends in eastern populations of these species.